Sharknado. If the thought of a bunch of sharks being thrown around in a tornado doesn’t make you smile immediately, you’re probably not the target audience of this film, so you might as well stop reading. When the UTG office caught wind of Sharknado’s existence this past October, we all lost our minds. Harkening back to the golden age of monster movies from the 50s and 60s, the SyFy Channel is single handedly bringing glorious b-movie fun back to the masses. Sharknado had me laughing and cheering throughout the entire film, which is more than most major productions can say this Summer. Now let’s get this out of the way now: by normal Hollywood standards, Sharknado is not a good movie. It has clunky computer generated effects, cheesy acting, and some stuff just doesn’t make sense. If you don’t recognize that, you’re probably not watching the same movie as me. But really, it doesn’t matter. This movie is gold. One of the most endearing qualities of Sharknado is the fact that it doesn’t try to be something it’s not. This is not Man of Steel. This is not Pacific Rim. This is a movie about a storm that floods LA, allowing sharks to swim the streets and eat everyone, and then a tornado whisks those sharks up into the air, literally raining terror and destruction down on the city. If you read the description, and it sounds over the top, well, that’s because it is. But the SyFy Channel knows that. 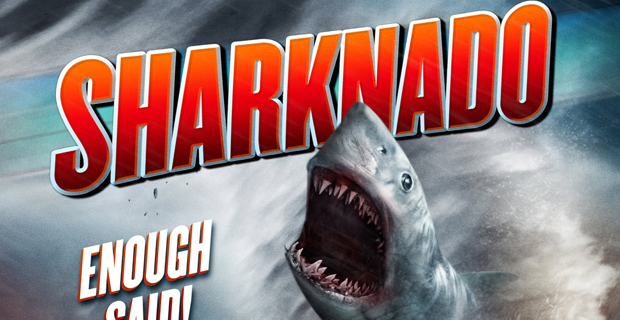 Sharknado doesn’t take itself too seriously, because it can’t. In the same vein as classic Roger Corman low budget movies, this film isn’t about showcasing an actor’s chops; it’s about the body count. And boy, are there some fun deaths in Sharknado. From flying sharks to limb ripping, this movie has something for everyone (and by everyone, I mean people who enjoy senseless violence). However the film culminates into one of the most insane, ridiculous climaxes I have seen in a long time, which if you weren’t satisified already, completely justifies the experience of watching. Sharknado is the film Steven Spielberg wished he had made. If this doesn’t become a Shark Week classic, well then the Discovery Channel is really missing an opportunity. Sharknado is the kind of film you don’t watch by yourself. Sure, it’s still going to be awesome, but this film is best enjoyed when you’re in the company of friends who also enjoy b-movie schlock. I watched this with a great friend of mine, and we were falling out of our chairs laughing. Once the film came to a close (with a fitting song to round out the credits), we found ourselves rewinding the film to rewatch our favorite moments. If you can get me to want to replay scenes I already watched not even 10 seconds after the film ended, you did something right. Is Sharknado for everyone? Hell no. Don’t watch this film with your pretentious friend who just watches Lawrence of Arabia on repeat. Sharknado is for the fans who get borderline sexually excited at the idea that sharks are twirling around in a tornado, terrorizing Los Angeles. In a film climate where everyone is trying to be serious, dark, and brooding, I want to thank Sharknado for giving me a film that made me smile and laugh, and helped to remind me that sometimes you just need to sit back and watch helpless LA yuppies get murdered in cold blood by man-eating sharks. This isn’t award winning cinema; it’s pure, unadulterated, shark-storming fun. Sharknado premieres tonight on the SyFy Channel at 9PM ET.